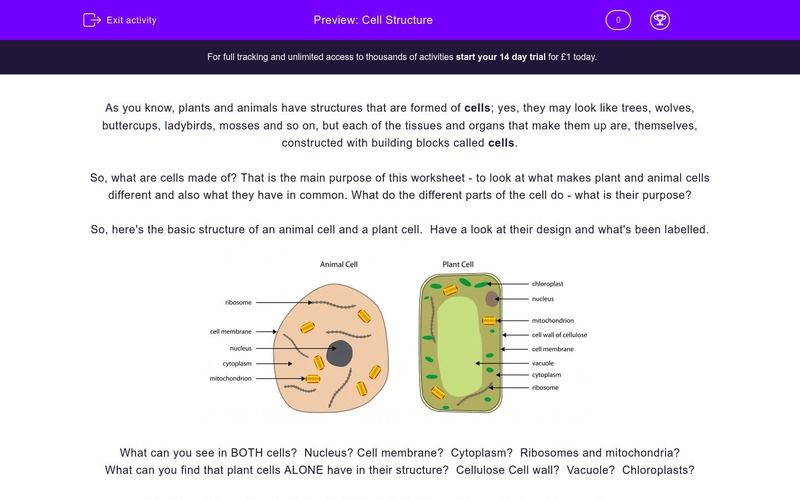 This worksheet helps students to review and to consolidate their basic understanding of cell structure: what constitutes a plant and animal cell and what their differences and similarities are. As you know, plants and animals have structures that are formed of cells; yes, they may look like trees, wolves, buttercups, ladybirds, mosses and so on, but each of the tissues and organs that make them up are, themselves, constructed with building blocks called cells. So, what are cells made of? That is the main purpose of this worksheet - to look at what makes plant and animal cells different and also what they have in common. What do the different parts of the cell do - what is their purpose? Look at these two cells, labelled X and Y. Match them with the labels to show which is an animal cell and which is a plant cell. Here is a list of different structures that cells are made of. Tick ones that are found in BOTH animal and plant cells. Here is that same list - this time tick structures that are ONLY found in plant cells. Look at this cell which has THREE of its structures labelled P, Q and R.
Match the label by dragging the correct name of the structure next to it. Look at this cell which has THREE of its structures labelled U, V and W.
Which of these descriptions most closely matches the function (job) of the cell membrane? Which of these descriptions most closely matches the function (job) of the cell wall? Which of these descriptions most closely matches the function (job) of the nucleus? 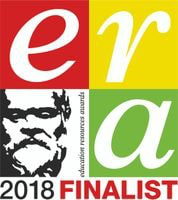 Which ONE of these cell structures is responsible for making food for the cell by using its green pigment to convert sunlight into food energy? Which ONE of these cell structures is responsible for extracting the stored food energy to make it available for the cell's functions? So what can help here? Well, first of all shape can often be a clue - plant cells are often a more regular shape than animal cells, but not always. Look especially for certain structures: can you see what looks like a double line between adjoining cells? Can you see green structures inside the cell? Those will point to the fact that it's a plant cell. 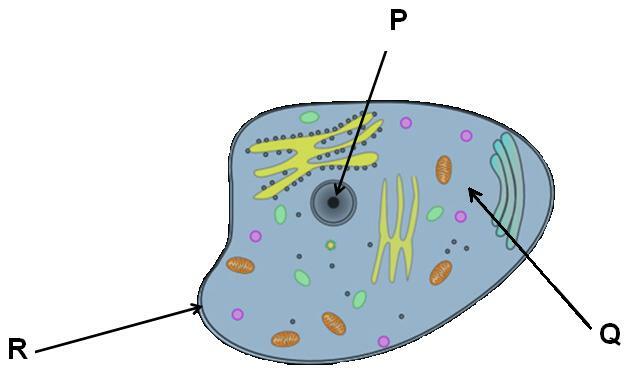 Whether the cell is from an animal or from a plant there are certain structures that pretty much all of them will have: a NUCLEUS to control what the cell's up to, CYTOPLASM where the cell's energy is extracted and a CELL MEMBRANE which acts like Border Control, in charge of what enters and leaves the cell. Plants don't have bones (or an exoskeleton) so each cell has its own support, called the CELL WALL, a much more rigid structure than the membrane. The CHLOROPLASTS are the structures where plants manufacture food using the energy of sunlight. A large central CELL VACUOLE taking up up to 90% of the cell volume is present in all plant cells. 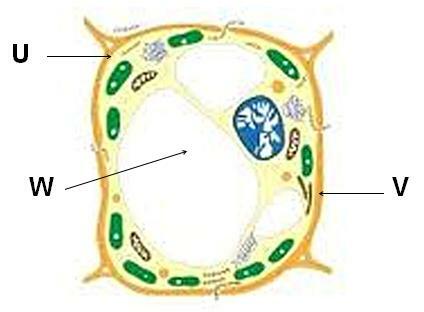 Animal cell vacuoles are much smaller. Plant cell vacuoles store water and provide extra support. When a plant does not get enough water, the vacuole shrinks because it loses a lot of water. Therefore, the plant cells lose the extra support and wilt before they eventually dry. The nucleus is always the dark blob inside the cell, surrounded by cytoplasm (which also contains masses of other structures). The cell membrane keeps the whole thing together - and don't forget the cell's 3D - that means it isn't flat; it's more like a box! The hardest thing here is sorting out the cell wall and membrane: think of it this way - the cell is surrounded by a membrane (inner line) which has a thick strengthening layer around it (cell wall). The cell vacuole takes up much of the inside part of the cell, certainly if it's full and pushing the cytoplasm towards the edge. The cell membrane is a bit like passport control: it makes sure that what the cell needs comes in (like oxygen, dissolved food) and helps used stuff (like CO2) out, while at the same time preventing the loss of chemicals the cell needs to work properly. The cell wall is made of a strong substance (called cellulose) which helps to give the cell shape - remember, it's not flat - it's like a box! The cell wall surrounds the cell membrane and contributes to the way in which the plant supports itself. The nucleus is the key structure of the cell - it provides the instructions that ensure the cell does what it should, a bit like the government of the cell. So if it's a muscle cell, the nucleus will tell it when to contract or relax; if it's a petal cell, the nucleus will control what colour it is, that sort of thing. Chloroplasts are sooo important! They contain the green pigment CHLOROPHYLL which has an amazing ability to take sunlight energy and use that to turn a gas and water into ... sugar! It's that process we depend upon for life. Wow! The cytoplasm contains masses of weird and wonderful structures, some of whose job is to take food (like sugar) and extract the energy from it so that the cell can use that energy to ... work!